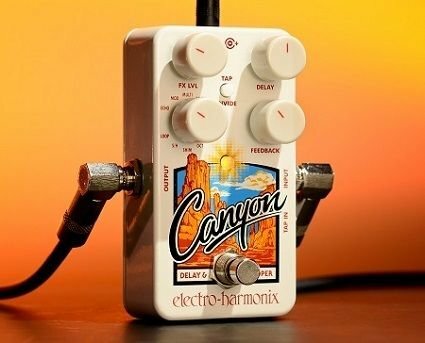 At its heart, the EHX Canyon is an incredibly deep delay pedal for its diminutive size. With a twist of the selector knob, you can choose from eight different delay voicings, including modulated delay, tape-like delay, and even a Shimmer setting. The Tap/Divide button determines the rhythmic subdivisions you'll access by tapping out the tempo. And holding it down changes the function of the control knobs for deep editing parameters such as the repeated signal's modulation, tape age, and more. The looping effect onboard the Canyon pedal is plenty for practice, songwriting, and even live performance. Simply pull up the loop function and step on the footswitch to start, stop, overdub, and erase your loops. And you can get up to 62 seconds of loop length, which is a ton of time for such a multi-faceted effects device. Electro-Harmonix didn't stop with delay and a looper. They also crammed a great-sounding reverb setting into the unit. When blended with the onboard delay, this setting is ideal for worship guitarists and other players who lean toward the ambient. And adding in a quick delay with low repeats instantly calls to mind the slap-back tones of the 1950s. 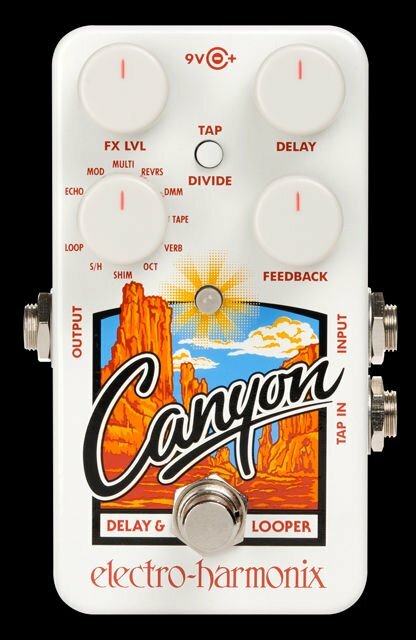 The reverb on the Canyon sounds so good, it would be well worth the price of admission on its own.